I hope you all had a safe and wonderful Thanksgiving! I just wanted to give you a quick update. Because my appointment on Wednesday was postponed due to a birth my midwife was attending, I had my appointment rescheduled for yesterday morning. I'm up 0.5 pound since the last appointment putting me at a grand total of 24.0 for the pregnancy (I think at this point in my pregnancy with Ewan, I was already at about 35-37 lbs of weight gain). My blood pressure is still great (114/70), Austen's heart rate was in the 150s, and even though she's getting obviously bigger (boy can I feel that!! ), little girl is still getting her Jane Fonda on at all hours of the day. And guess what? I'm still measuring exactly on track for 33 weeks. I know all of these updates must sound exactly the same but personally, I still can't get over how utterly normal and textbook this pregnancy has been. Believe me, I do not take it for granted in the least, especially having gotten to know some of you now who have had difficulty getting pregnant, and/or had difficult pregnancies besides (my hat is off to you, truly) -- but honestly, it still surprises me every time when I find out everything is humming along exactly as it should. We're working on some optimal fetal positioning techniques to help get Austen in the best possible place for birth. She's been head down the whole time (thank you, baby girl! ), but really prefers to have her back and rear smooshed into my right side. We're doing some sleep positioning as well as spending time on hands and knees to coax her more toward the middle with her back up against the front of my belly. So far, our success has only been temporary (she always finds her way back to the right side), but hopefully by the time she's ready to come, we can get her in the best possible place for a relatively quick and easy labor. And since I'm nearing the end of my pregnancy, I thought I'd share just a few things that I've found incredibly helpful to me. Just to be perfectly clear, no one at all has asked me to write about these things and I'm not getting any kind of incentives (financial or otherwise) to feature any of the products below. These are just things that I find incredibly useful right now (and those of you who are or who have ever been pregnant know that a pregnant lady needs all the help she can get). Even when I'm not pregnant, I love wearing tank tops. They're great layering pieces and are generally inexpensive enough to buy one in every color once you find one you love. I tried three different brands of maternity tanks, and the Liz Lange for Target ones are literally the only ones that covered my pregnant body for the entire pregnancy. As an added bonus, they're incredibly affordable and come in a variety of yummy colors. The ones by Gap Maternity and Motherhood stopped covering my pregnant belly shortly after 20 weeks -- a serious maternity tank FAIL. So I would totally love this even if I wasn't pregnant, but I've had enough uses for this while pregnant that it just begs to be shared here. 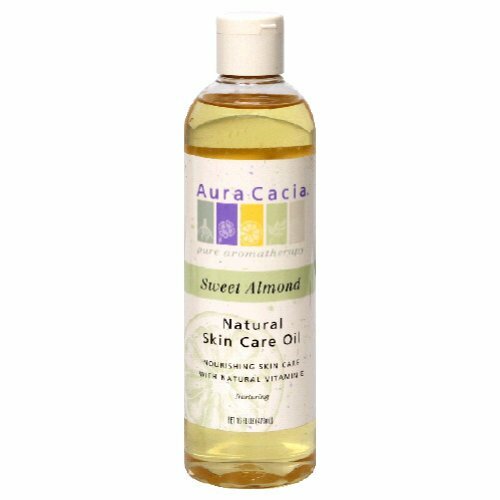 I was looking for an all-natural solution for keeping my belly and other skin moisturized, and sweet almond oil was just the answer I was looking for. I rub it on my belly every morning after my shower. I use it on my arms and legs instead of lotion. I pour a cap full or so into a hot bath so my skin doesn't dry out. I remove my eye makeup with it. I use it on my lips when they're especially chapped and cracked. James uses it on my feet when he rubs them. Initially, I bought a 16 oz. bottle at a local Whole Foods for around $17. But I found it on Amazon for around $11-12 (it seems the price fluctuates a bit). I recently ordered three bottles, got free shipping, and was not charged any tax to boot. Definitely a win/win situation! James and I discovered Teeccino shortly after we were married. Though you could consider it an alternative to coffee, it really is in its own category. 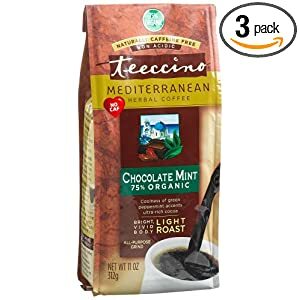 Made from chicory root and other all natural ingredients, Teeccino is a tasty and healthy NO CAFFEINE replacement for a cuppa something wonderful in the morning. We love to make it super-concentrated, sweeten it with Stevia (an all natural, calorie free sweetener), refrigerate it, and mix about 2 parts brewed Teeccino with 1 part vanilla almond milk and enjoy it over ice. It's great hot, as well. And seriously, it tastes like you're drinking dessert without all the extra calories. This is something we're saving money on by signing up for Amazon's "Subscribe & Save" option (save money on the product, and get free shipping -- another win/win!). I learned about this website through a Facebook friend of mine. "Chocolate Covered Katie" concocts the most delicious and (would you believe it?) healthy desserts I've ever tasted. Because I've had such a sweet craving this time around, it's been great to find a way to indulge my appetite for sweetness without compromising on nutrition. So far, the Cookie Dough Dip and Chocolate Fudge Pie are our absolute favorites! We recently acquired a VitaMix while they were doing their roadshow at Costco. As far as this happy customer is concerned, it is living up to the hype. I make delicious green smoothies in there, breakfasts, desserts, dinners (homemade cream of tomato soup, anyone? ), nut butters, and so on. It's all so healthy, and clean-up is a snap! When I was pregnant with Ewan, my doula (the wonderful Annie) suggested I stock up on coconut water to stay well hydrated and replenish essential nutrients both before and during labor. I tried a can of every brand I could get my hands on. My tastedbuds just did not approve. I tried sweetening with stevia, adding a squeeze of lime, adding other fruits to it -- it was just so hard to make it palatable for myself. 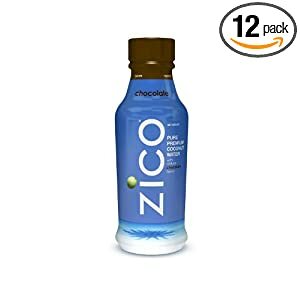 And then I discovered Zico Chocolate Coconut Water. It's got all the goodness of coconut water with some coconut cream added, as well as some cocoa. This stuff tastes like rich, delicious chocolate milk (at 110 calories per 14 oz.) and satisfies that sweets craving I talked about earlier. I have no trouble downing these babies at all. The price of a case (which I've linked to on Amazon) is a bit pricey, but they have them at our Costco at a lower everyday price, and they have an instant $4 rebate per case right now until the new year. Needless to say, I am stocking up. Wow. I just looked at my list and realized most of these things fall into the Food & Beverage category. Ha!! Well, a pregnant lady has got to eat and get proper nutrition, doesn't she? What about you? Was there anything you came to use a lot during pregnancy? What do you recommend to other expectant mamas that helped you out (or that you just really liked)? Jump over to the Team Ewan Community page on Facebook to tell us your answer.